Paris – Christie’s FIAC week sales continued with a packed sale room for the evening auction of the Regards Croisés: Collection Jean-François & Marie-Aline Prat, which realised a stunning €36,5M/£32,8M/$43M selling 91% by lot and 98% by value. In his first time on the Parisian rostrum, Global President Jussi Pylkkanen sold 32 important works of art, including the Basquiat’s 1986 painting Jim Crow which sold for €15M becoming the most expensive artwork by the artist sold in France. Paul Nyzam, Head of Sale: “It has been a real honor to work with Marie-Aline Prat for the past year organising this exceptional sale. Tonight’s evening auction marked a new turning point for Christie’s France Post-War & Contemporary art department. Collections of such a high quality can be counted of the fingers of one hand, and the exceptional results realised illustrate how important this family has been to the French artistic scene”. In addition to the success of the Basquiat painting, French records were established tonight for three further artists including Jean Dubuffet’s with Les Versatiles which sold for an impressive €5,557,500/£5,001,750/$6,557,850, against a presale estimate of €3,500,000-4,500,000, Lucio Fontana with Concetto spatiale, Atteseselling for €4,207,500/£3,786,750/$4,964,850 after a long bidding battle and Sigmar Polke with his highly anticipated Was machen die Russen in Mexiko which realised €3,532,500/£3,179,250/$4,168,350. The Modern Art Museum of Paris preempted four lots tonight including a painting by Martin Barré which sold for €162,500, Tony Cragg’sAutoportrait which realised €50,000, Gary Hume’s The Moon which sold for €62,500 and Haim Steinbach’s sculpture was preempted for €81,250. 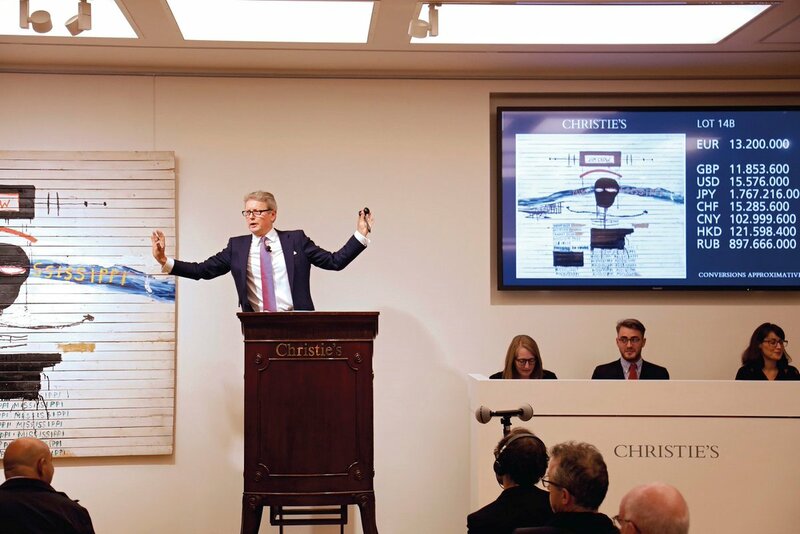 The evening saw strong bidding across the room, telephones and online with Simon Hantaï’s oil on canvas selling to a Christie’s Live bidder for €247,500 (lot 2). Christie’s FIAC week sales continue Saturday 21 October with the day sale of the Prat collection starting at 2:30 pm.